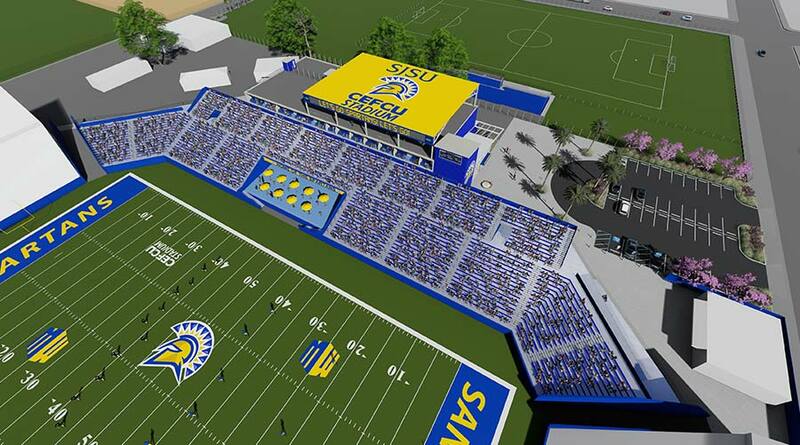 San Jose, Calif. — San Jose State University is pleased to announce that it has received two major gifts to support a new football operations center on the east side of CEFCU Stadium, Home of the Spartans. 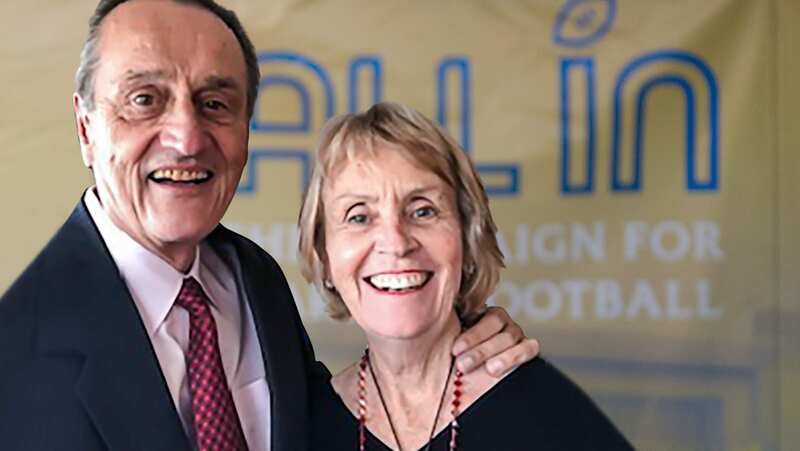 Thomas Thompson, ’72 Behavioral Science, and his wife, Jane Bradley, have committed $500,000 to support the development of the new football facility, with a remaining percentage of their trust to establish the Thomas E. Thompson Athletics Scholarship. SJSU Athletics is also proud to share that an additional gift of $500,000 has been committed to support the football center by an anonymous donor. 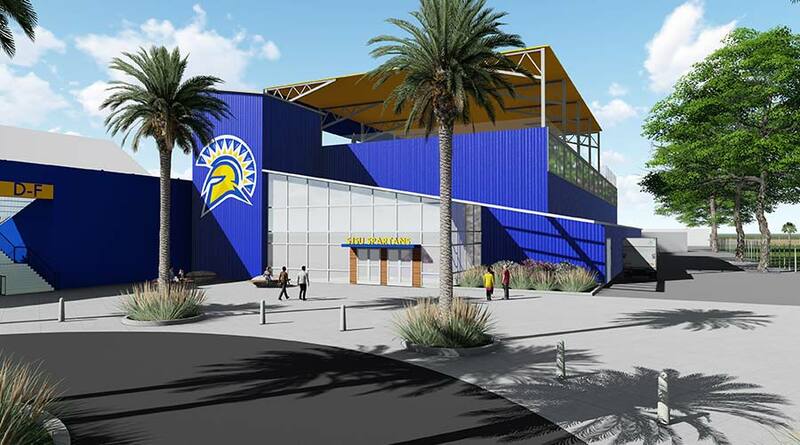 By supporting the creation of the new SJSU football operations building, these gifts will enable future generations of Spartan athletes to pursue an education while playing NCAA Division I sports. At 6 feet 8 inches, Thompson gravitated toward basketball at a young age, playing in high school and community college. He later transferred to San Jose State. Thompson was the first in his family to graduate from both high school and college–achievements that made it possible for him to pursue careers in juvenile probation, construction management, trade association management and real estate. He and his wife are grateful for the opportunity to give back to his alma mater. The anonymous donor, who graduated from San Jose State in the 1960s, is also a loyal fan of Spartan football. To track fundraising progress and learn how you can support Spartan football, please visit sjsufootball.com or contact Josh Thiel, deputy athletics director for athletics advancement, at 408-924-1697 or joshua.thiel@sjsu.edu. The founding campus of the 23-campus California State University system, San Jose State provides a comprehensive university education, granting bachelor’s, master’s and doctoral degrees in 250 areas of study—offered through its eight colleges. With more than 35,000 students and nearly 4,370 employees, San Jose State University continues to be an essential partner in the economic, cultural and social development of Silicon Valley and the state, annually contributing 10,000 graduates to the workforce. The university is proud of the accomplishments of its more than 270,000 alumni, 60 percent of whom live and work in the Bay Area. San Jose State sponsors 22 (nine men’s and 13 women’s) NCAA Division I intercollegiate sports programs for approximately 470 student-athletes annually. In football, the Spartans are a member of Division I’s Football Bowl Subdivision (FBS), the NCAA’s highest level of competition. The Spartans’ primary conference affiliation is with the Mountain West. Selected teams belong to the Mountain Pacific Sports Federation (MPSF), the Western Athletic Conference (WAC) and the Golden Coast Conference (GCC). San Jose State has 10 NCAA team championships and 52 NCAA individual titles. Sixty-two (62) Spartans competed in one or more Olympic Games. San Jose State athletes have won seven gold, six silver and seven bronze medals at the Olympics. Annually, about one-third of the student-athlete population earns either institutional, conference or national recognition based on outstanding academic performance. San Jose, Calif. — San Jose State University is pleased to announce that it has received a $1.6 million planned gift from an anonymous donor. The gift will endow a lectureship in the computer science department, establishing a teaching position upon the donor’s death and expanding opportunities for computer science majors to hear from experts, and explore research, career and internship programs in the field. San Jose State’s computer science program is accredited by the Accreditation Board for Engineering and Technology, a nonprofit organization that accredits competitive programs across the nation. 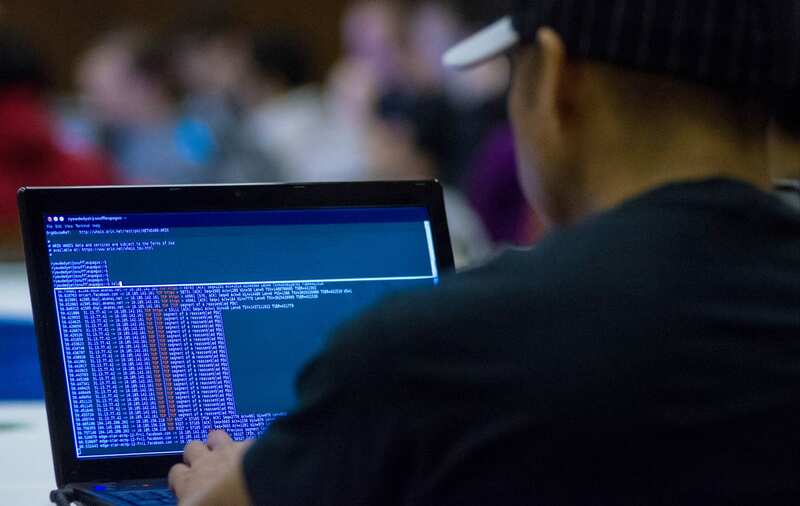 In addition to undergraduate and master’s degrees, the department offers a Computer Science Certificate in Cybersecurity, and a bachelor’s of science in software engineering offered in partnership with the computer engineering department. Computer science, jointly with the biological sciences and mathematics and statistics departments, will offer a master of science in bioinformatics, starting later this year. Although the donor is not originally from this area, after moving here the donor has been able to take advantage of the many opportunities that the Silicon Valley offers in the tech industry. However, over the years, the donor noticed that many local students who grow up surrounded by these great companies don’t have a clear idea how to tap into the opportunities that surround them. By endowing a teaching position in computer science, the donor is hoping to ensure that Spartans interested in the field continue to receive an excellent education. To learn how you can support the College of Science, please contact Emily Lane, director of development, at 408-924-1145 or emily.lane@sjsu.edu. The founding campus of the 23-campus California State University system, San Jose State provides a comprehensive university education, granting bachelor’s, master’s and doctoral degrees in 250 areas of study—offered through its eight colleges. With more than 35,000 students and nearly 4,370 employees, San Jose State continues to be an essential partner in the economic, cultural and social development of Silicon Valley, the state and the world, annually contributing 10,000 graduates to the workforce. The university is immensely proud of the accomplishments of its more than 270,000 alumni, 60 percent of whom live and work in the Bay Area. San Jose, Calif.— San Jose State University is pleased to announce that it has received a $1 million gift commitment from alumnus Kevin Swanson, ’87 Finance, and his wife Sandy Swanson. Their gift will contribute to a new football operations center on the east side of the CEFCU Stadium, Home of the Spartans. The Swansons’ San Jose financial services office is decorated in Spartan regalia, from a SJSU flag hanging on the wall to Kevin’s diploma. 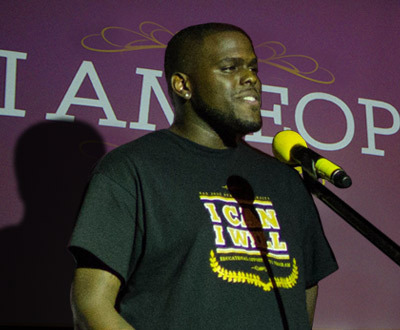 As an undergraduate, Kevin was active in the Delta Upsilon fraternity, a network of friends and colleagues who invited him back after graduating to serve as a fraternity advisor. For 11 years, he mentored Spartans and Sandy attended countless pledge dances and university events. The chance to connect with students on a personal and professional level inspired the Swansons to attend Spartan football games, enjoying tailgates with a community of friends. In 2018, the couple learned about Beyond Football, which offers unique programming for Spartan football players to develop career and life skills that extend beyond the sport. Together, they volunteered to offer mock interviews alongside a cohort of Silicon Valley professionals to critique the students’ interview techniques. The chance to interact one-on-one with football players in a professional capacity inspired them to find a lasting way to give back. The Swansons believe that by supporting the football program, they can multiply their impact for all student-athletes at San Jose State. To track fundraising progress and learn how you can support the football operations center, please visit sjsufootball.com or contact Joshua Thiel, deputy athletics director for athletics advancement, at 408-924-1697 or via email at joshua.thiel@sjsu.edu. The founding campus of the 23-campus California State University system, San Jose State provides a comprehensive university education, granting bachelor’s, master’s and doctoral degrees in 250 areas of study offered through its eight colleges. The university is proud of the accomplishments of its more than 260,000 alumni, 60 percent of whom live and work in the Bay Area. San Jose State University sponsors 22 (nine men’s and 13 women’s) NCAA Division I intercollegiate sports programs for approximately 470 student-athletes annually. In football, the Spartans are a member of Division I’s Football Bowl Subdivision (FBS), the NCAA’s highest level of competition. Annually, about one-third of the student-athlete population earns either an institutional, conference or national recognition based on outstanding academic performance. San Jose, Calif. — San Jose State University is pleased to announce that it has received a $2 million gift commitment from alumnus John Hopkirk and his wife Anne Murphy. Their gift will support a critical resource for the Spartan football program; a new state-of-the-art football operations center on the east side of CEFCU Stadium, Home of the Spartans. The football operations center will include locker rooms, offices, a student-athlete lounge, an auditorium and premium seating options on the 50-yard line. The project will rebuild the stadium’s east side. The gift will add to improvements underway throughout South Campus, including the recently completed soccer, tennis, golf, and softball facilities. John Hopkirk worked his way through school at San Jose State while pursuing a degree in business accounting. Hopkirk’s love for SJSU athletics took off after he graduated and began his professional career as a certified public accountant. As an avid supporter of SJSU football and basketball, Hopkirk believes he may be the only fan who has seen every SJSU men’s post-season basketball game since he first enrolled at San Jose State in the late 1960s. In 1987, John met his wife, Anne Murphy, a University of San Francisco graduate. 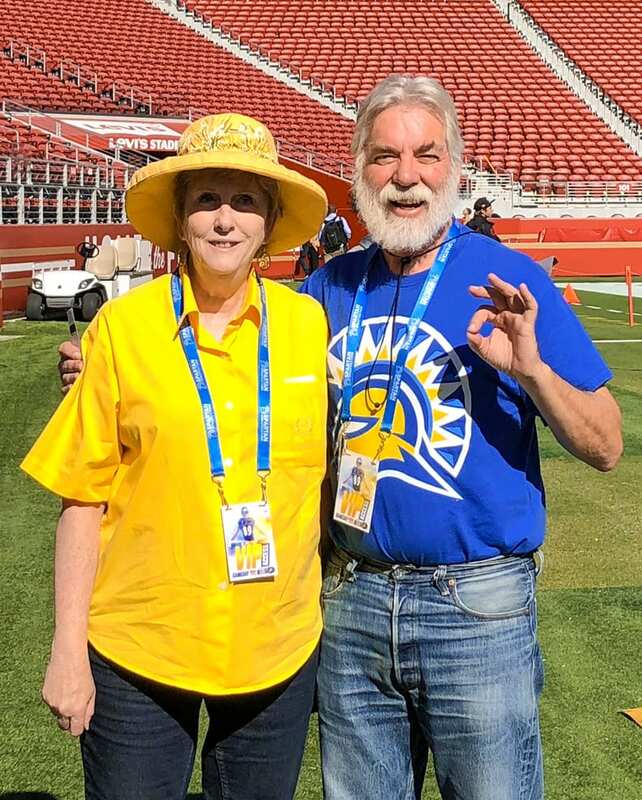 Anne has embraced John’s passion for SJSU athletics and the couple travels all over the country to watch the Spartans compete. “I have been following Spartan football for over 50 years. It has brought me much joy, and we have made many great friends through our common love of Spartan football,” said Hopkirk. “I received a great education from San Jose State, and Anne and I thought we needed to give back to the university to show our appreciation. I hope our gift inspires others to do the same. To learn how you can support the football operations center, please visit www.sjsufootball.com or contact Joshua Thiel, Deputy Athletics Director for Athletics Advancement, at (408) 924-1697 or via email at joshua.thiel@sjsu.edu. The founding campus of the 23-campus California State University system, San Jose State provides a comprehensive university education, granting bachelor’s, master’s and doctoral degrees in 250 areas of study – offered through its eight colleges. With more than 35,000 students and nearly 4,370 employees, San Jose State University continues to be an essential partner in the economic, cultural and social development of Silicon Valley and the state, annually contributing 10,000 graduates to the workforce. The university is immensely proud of the accomplishments of its more than 260,000 alumni, 60 percent of whom live and work in the Bay Area. The Student Union will be named the Ramiro Compean and Lupe Diaz Compean Student Union, pending approval by the California State University Board of Trustees (Photo: Muhamed Causevic, ’15 BFA Graphic Design). SAN JOSE, CA–San Jose State is pleased to announce that it has received a $15 million gift commitment from South Bay resident and friend of the university Lupe Diaz Compean. The gift will support student success initiatives and scholarships. In addition, the gift will support the maintenance of SJSU’s newly renovated and expanded Student Union, and the many activities housed in this structure located in the heart of campus. The building will be named the Ramiro Compean and Lupe Diaz Compean Student Union in honor of Mrs. Compean and her late husband, pending approval by the California State University Board of Trustees at its March 8-9 meeting in Long Beach, Calif. President Martin and Vice President for University Advancement Paul Lanning will represent SJSU at the meeting. Student Union interior (Photo: David Schmitz). A Student Success Fund to support initiatives that foster student success and increase retention and graduation rates. Three scholarship endowments to support emancipated foster youths, California Dream Act students, and a merit scholarship for high-performing students. A Student Union Programming Fund to provide support for visiting lectures, art exhibits, workshops and other student-focused special events and programming. A Student Union Operating Fund that will provide resources for ongoing maintenance and operating needs of the facility. Lupe Diaz was born in 1926 in Edinburg, Texas and was the oldest in a family of 10 children. In 1955, she married Ramiro Compean, who was born in Reynosa, Mexico, in 1932. He was one of seven children in his family. Mr. Compean passed away in August 2002. In 1956, one year after they were married, the Compeans moved to San Jose. Mr. Compean worked for George Day Construction building houses in Saratoga. Mrs. Compean attended school and helped her husband in the business. 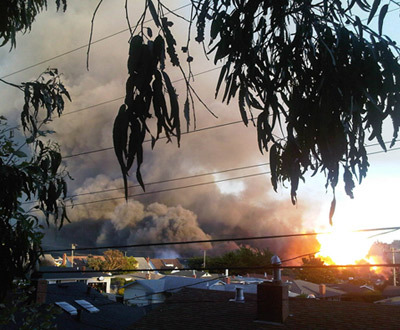 They saved their money and soon were able to purchase a home in Almaden Valley. They continued to buy properties as they were able. Mrs. Compean, at age 89, is still actively managing the properties she owns. Mrs. Compean is not a graduate of SJSU, but believes very strongly in the mission of the institution and the importance of education. She first approached SJSU regarding making a gift in the mid-1990s. 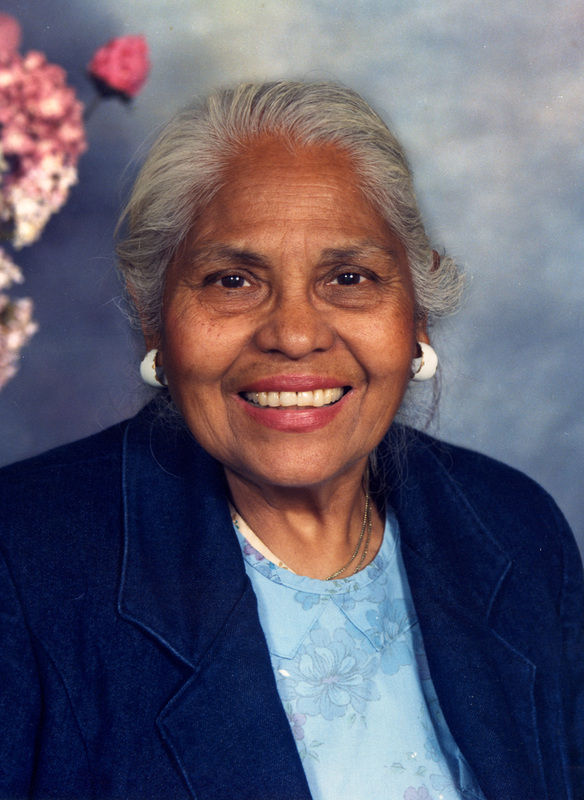 She and her husband had heard that SJSU had a good Mexican American Studies Department and wanted to contribute. Eventually, those conversations turned to the possibility of including the university in their estate. 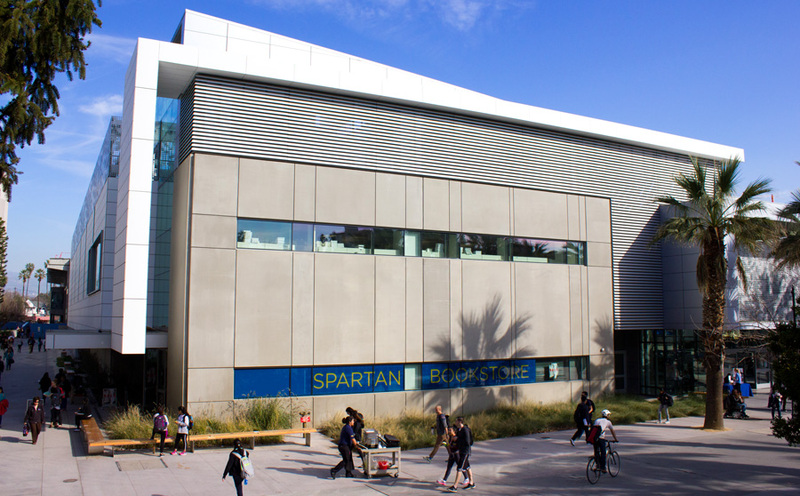 Following Mr. Compean’s death in 2002, Mrs. Compean continued the conversation with University Advancement and indicated that SJSU would be a beneficiary of half her estate. In 2012, Mrs. Compean and her certified public accountant, Anne Lee of Bauerle, Lee and Associates, LLP, approached the university to explore how Mrs. Compean might experience the impact of her legacy while she was still alive. Over the course of the next three years, discussions continued regarding the use of the gift and how the gift would be structured. In December 2015, Mrs. Compean finalized the gift agreement. The founding campus of the 23-campus California State University system, San José State provides a comprehensive university education, granting bachelor’s, master’s and doctoral degrees in 145 areas of study with an additional 108 concentrations – offered through its eight colleges. With more than 32,000 students and nearly 4,370 employees, San José State University continues to be an essential partner in the economic, cultural and social development of Silicon Valley and the state, annually contributing more than 7,000 graduates to the workforce. Samsung CEO Oh-Hyun Kwon, SJSU President Susan Martin and San Jose Mayor Sam Liccardo (photo: Orbie Pullen). 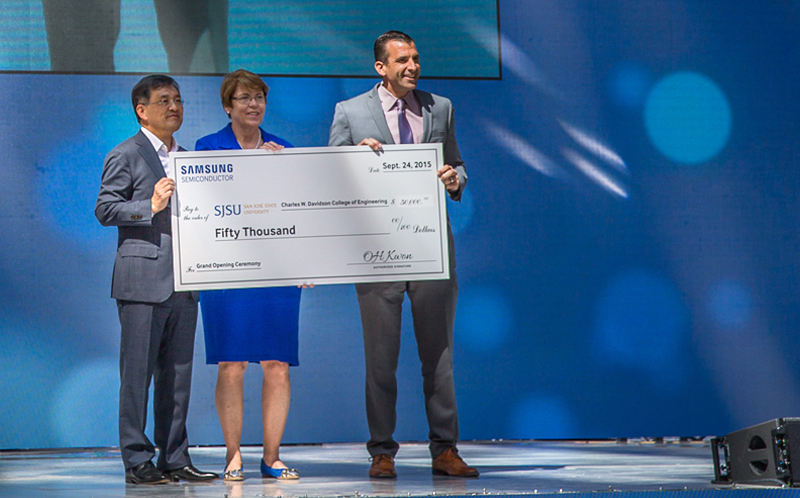 Samsung presented San Jose State University Interim President Susan Martin and San Jose Mayor Sam Liccardo with a $50,000 gift on Sept. 24, making SJSU the first recipient of $1 million in scholarships to be awarded to California’s public universities. The company made the gift to the Charles W. Davidson College of Engineering, with the intention of covering tuition and living expenses for two students this year. Details on the selection process are in the works. The announcement came as Samsung celebrated the grand-opening of its 1.1-million-square foot headquarters in North San Jose for its U.S. semiconductor operations. Read the Samsung news release. 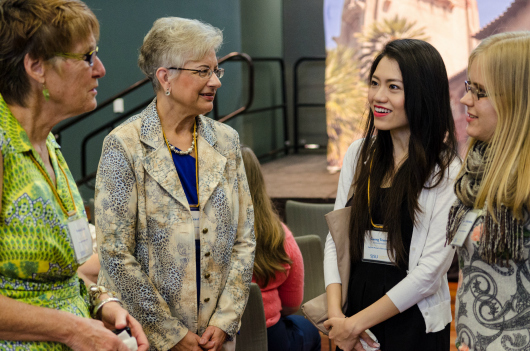 More than 50 students received $150,000 in scholarships at the SJSU Alumni Association Scholarship Awards Reception on Sept. 15 in the Student Union. “All of the scholarship recipients have a clear vision of how they will achieve concrete goals and make a difference after completing their college degrees,” said Alumni Association President Coleetta McElroy, ’97 Public Administration. She also serves as the university’s director of financial aid and scholarships. James Keeley, ’16 Therapeutic Recreation, is a disabled veteran who works with homeless veterans. Maria Stone, ’16 MA French and MS Physics, seeks to participate in space research looking for life on other planets. Melissa Tracy, ’17 Child and Adolescent Development, chose her field based on her personal experience with foster care. Read about more scholarship recipients and learn how to apply next year on the Alumni Association website. Linh Dieu Do, ’16 Chemical Engineering, received the Hal Riddle Memorial Scholarship (Photo: Randy Vazquez, ’16 Journalism). 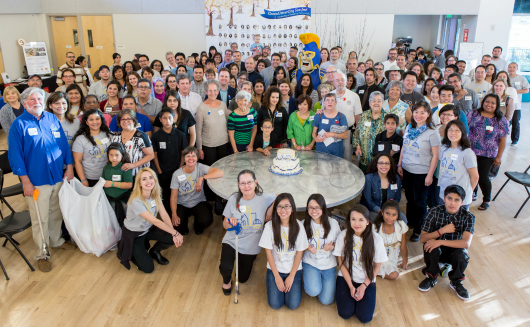 The SJSU program is among the most generous in the California State University system. In this way, alumni and students alike are part of a long legacy at San Jose State, spanning a half century of giving and receiving. And this legacy will continue, as this year’s recipients vow to pay it forward. 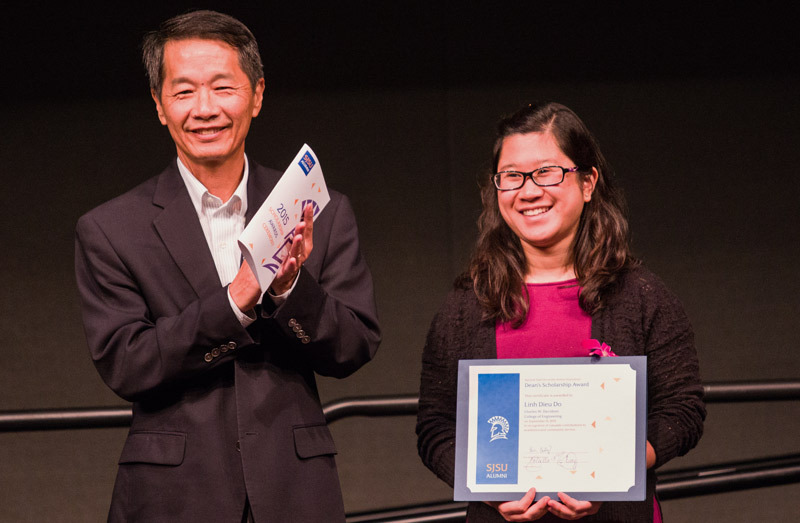 Linh Dieu Do, ’16 Chemical Engineering, received the Hal Riddle Memorial Scholarship, named for a lifelong educator and member of the Alumni Association’s Santa Clara County chapter. The San Jose State men’s water polo team jumped back in the pool after a 34-year hiatus for its season opener against the Santa Clara Broncos on September 5 (Photo: Terrell Lloyd). In the 1960s and 1970s, SJSU had a powerhouse water polo team. They won a national title in 1968, and finished in the top five nationally four times in the 1970s. But in 1981, the school discontinued the program to comply with Title IX regulations. 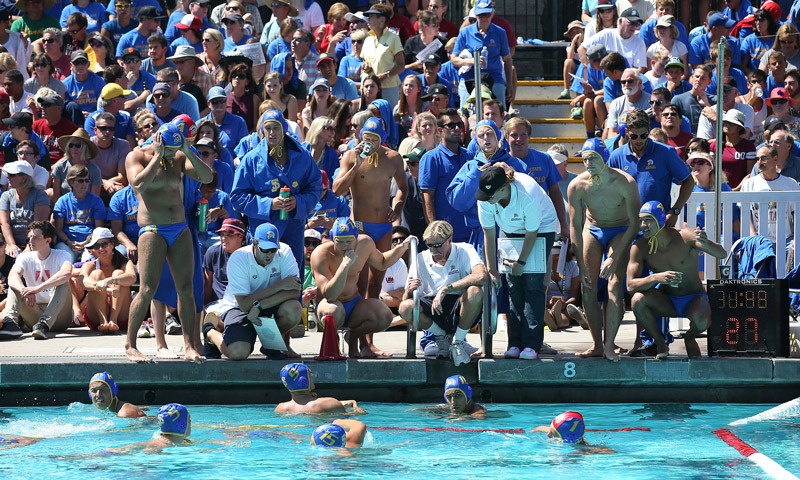 Bill Simpkins, a former college water polo player himself and son of long-time SJSU benefactors and alumni Alan and Phyllis Simpkins, repeatedly pressed the university to reinstate the sport. But the funds weren’t there. So Simpkins spearheaded an effort to raise enough money to bring the sport back. Before the team’s first game, several donors and former water polo players participated in a cap ceremony, giving swim caps to the 19 players on the current roster (Photo: Terrell Lloyd). Bill Simpkins and his wife Brigid made a generous donation. So did Peter Ueberroth,’59 Business Administration. Ueberroth is a former travel industry executive, Major League Baseball commissioner and U.S. Olympic Committee chairman. Jane Hind set up a $1 million dollar endowment in her late husband’s name. 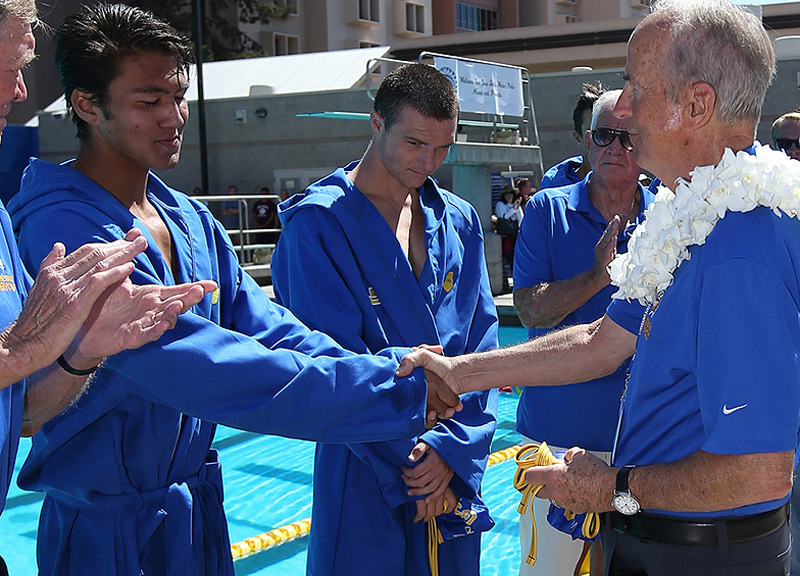 Greg Hind, ’69 Health Science, was an All-American water polo player in the 1970s at SJSU. Altogether, more than 100 people donated more than $3.5 million, which will sustain the program for five years until the university takes over the financing. Interest from the Greg Hine endowment will fund student-athlete scholarships beginning next year. Before the team’s first game in September, several donors and former water polo players participated in a cap ceremony, giving swim caps to the 19 players on the current roster. For a moment in time, right there on the pool’s edge, the years melted away as the generations bonded over their love of the game and their quest to keep this Spartan tradition going strong. CommUniverCity San Jose engages local residents, SJSU faculty members and students, and city officials in learning projects that accomplish neighborhood-defined goals (David Schmitz photo). 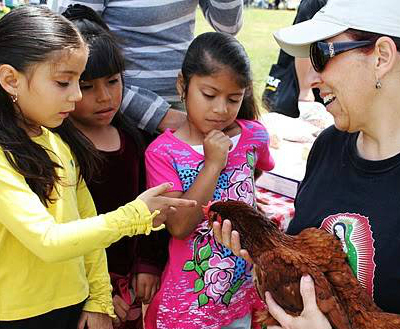 In recognition of its extraordinary community outreach initiatives, four members of the Association of Public and Land-grant Universities, including San Jose State, have been selected as regional recipients of the 2015 W.K. Kellogg Foundation Community Engagement Scholarship Award. As regional winners, SJSU, Texas Tech University, the University of Minnesota, and the University of New Hampshire will represent and compete for the national C. Peter Magrath Community Engagement Scholarship Award, which will be presented during the APLU Annual Meeting Nov. 15-17 in Indianapolis, Indiana. The C. Peter Magrath Community Engagement Scholarship Award includes a sculpture and $20,000 prize. The three regional winners not chosen for the Magrath award will each receive a cash prize of $5,000. Since 2006, APLU and the Engagement Scholarship Consortium, with support from the W.K. Kellogg Foundation, have partnered to honor the engagement, scholarship, and partnerships of four-year public universities. The award recognizes programs that demonstrate how colleges and universities have redesigned their learning, discovery, and engagement missions to become even more involved with their communities. The national award is named for C. Peter Magrath, APLU president from 1992 to 2005. The Magrath Awards reward the significant impact our universities make in their communities, states, and across the nation as well as the world,” said APLU President Peter McPherson. A team of community engagement specialists judged this round of the award. A second team will pick the national winner following presentations at the 2015 National Engagement Scholarship Conference in September. CommUniverCity San Jose is a unique community-university-city partnership that engages local residents with faculty members and students at San Jose State and city staff members in learning projects that accomplish neighborhood-defined goals. With nearly one million residents, San Jose is characterized by vast economic inequality and profound challenges with respect to poverty, unemployment, homelessness, gang violence, and low educational attainment. To address these needs, CommUniverCity creates and supports 50 community action projects annually. 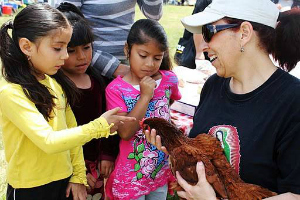 Projects range from after-school tutoring and nutrition education to adult financial literacy classes. 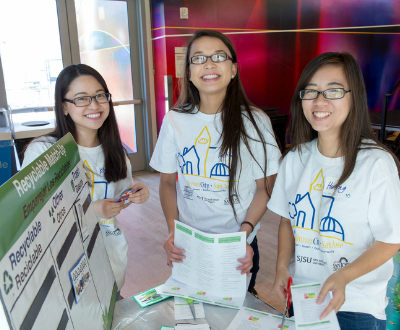 CommUniverCity’s structure can be described as three legs of a stable stool, with SJSU, the city of San Jose, and local organizations and residents each providing equal support for project identification and implementation. SJSU’s role in this “town-gown” (city-university) partnership is threefold. 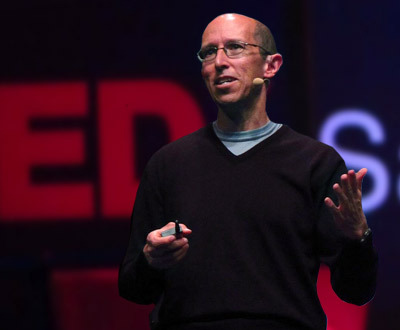 First, faculty members apply subject-matter expertise to solve real-world problems. Second, students participate in community-engaged learning projects. 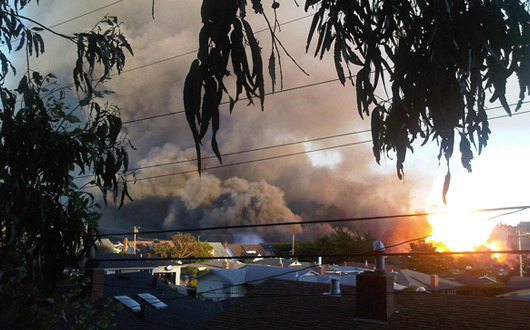 Third, SJSU provides financial and administrative support. Over the past decade, this consistent engagement of faculty and students has generated a multitude of short-term studies and longer-term research, including a five-year comparison of social capital indicators within the service area. The founding campus of the 23-campus California State University system, San Jose State provides a comprehensive university education, granting bachelor’s and master’s degrees in 134 areas of study with 110 concentrations—offered through its eight colleges. 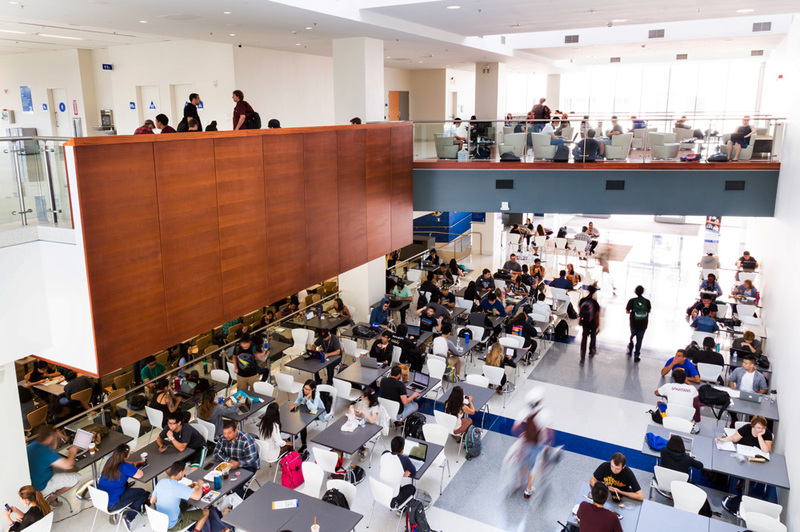 With more than 30,000 students and nearly 4,000 employees, San Jose State continues to be an essential partner in the economic, cultural and social development of Silicon Valley and the state, annually contributing more than 7,000 graduates to the workforce. Cuong Truong, ’14 Nursing, plans to work toward ensuring all elderly patients receive quality care. 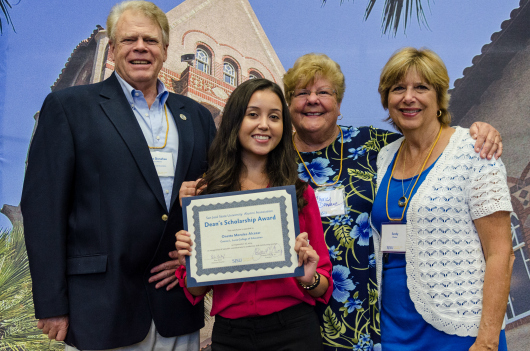 She is a recipient of a San Jose Woman’s Club Scholarship (photo by Brandon Chew). 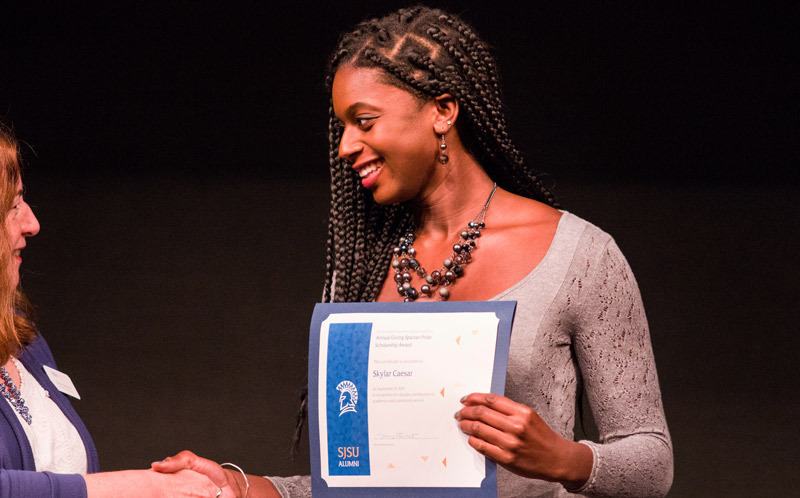 Aspiring professionals preparing to contribute to every part of our community and economy are recipients of 2014-15 SJSU Alumni Association Scholarships. 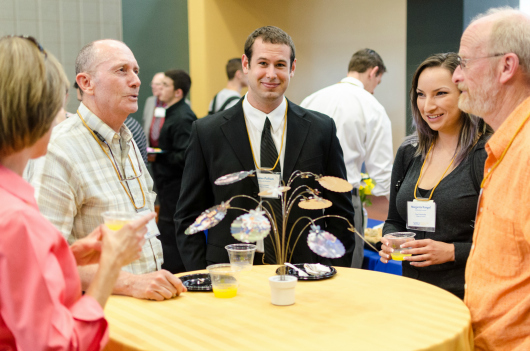 The more than 30 recipients were invited to gather for a reception Sept. 16 in the Student Union ballroom. The group includes a future art professor, nurse and business owner as well as multiple engineers, accountants, lawyers, doctors, teachers, social workers and fine artists. Student recipients apply each spring through the SJSU Office of Financial Aid and Scholarships. The specific criteria and amount for each scholarship varies. But the overall objective is the same: to provide alumni with the opportunity to give back by supporting current students. Onette Morales-Alcazar, ’13 English, is seeking a teaching credential so she can support students learning English as a second language. Named a Connie L. Lurie College of Education Dean’s Scholar, she received the Pat Porter Memorial Scholarship (photo by Brandon Chew). An excellent example is Angelina Loyola, ’10 Sociology, ’15 Mexican American Studies. Recipient of a College of Social Sciences Dean’s Scholarship, she plans to teach at the high school or community college level so that she may empower her students to advance not just themselves but the entire community. Joshua Cruz, ’16 Computer Engineering, has taken advantage of the many leadership opportunities available to students at SJSU. A recipient of a Charles W. Davidson College of Engineering Dean’s Scholarship, he has served as a resident assistant, orientation leader, student instructional assistant and Spartan Marching Band member. Tristan Pulliam plans to go to medical school. The recipient of a College of Science Dean’s Scholarship, he said, “I hope to one day reciprocate this investment by investing in the lives of future SJSU students” (photo by Brandon Chew). Daniel Fenstermacher, ’16 Fine Arts, expresses his aspirations and sense of community through photography. The recipient of the Hoover Langdon Scholarship has his own business, currently specializing in aerial photography, including remarkable images of downtown San Jose captured using a drone. 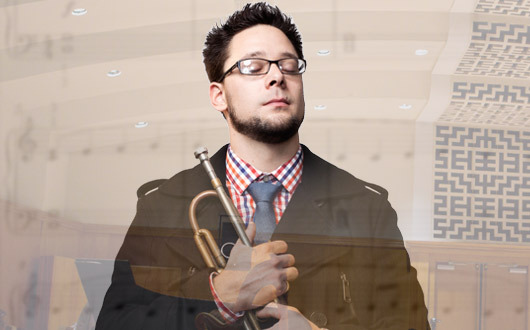 The generous support of alumni and friends makes these scholarships possible. Learn more about supporting the Alumni Association scholarship program. 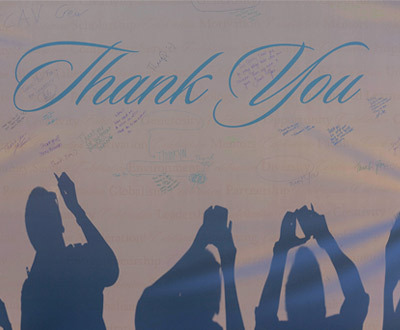 We would like to express our gratitude to everyone who continues to take our message and mission to heart (Robert C. Bain photo). SAN JOSE, CA – Individuals, foundations and corporations made more than $31 million in gift commitments to the university during the fiscal year that ended June 30, 2014, demonstrating heightened support for philanthropic giving to San Jose State. Approximately $22.6 million will be available this year to support student scholarships, innovative programs and facility improvements. Additional funds will supplement the university’s endowment, now valued at more than $120 million. The endowment ensures long-term continuity and sustainability of programs funded by donors. In 2013, San Jose State completed its first-ever comprehensive fundraising campaign, “Acceleration: The Campaign for San Jose State.” The university received over $208 million from individuals, corporations and foundations. Before the campaign, the university raised approximately $10 million annually. Afterward, the sum more than tripled. For the $31 million raised last year, individuals gave $24 million. Corporations and foundations provided $7 million. More than $19 million came through planned giving, which includes giving through financial and estate plans. 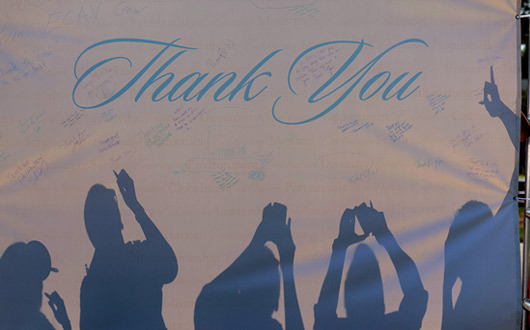 The gifts benefit all of SJSU’s colleges and many programs. 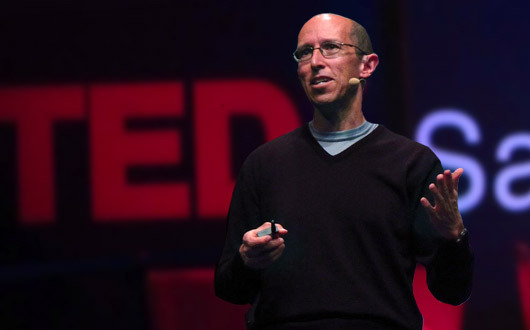 Professor Eugene Cordero speaking at the 2012 TEDxSanJoseCA event on the topic of reducing annual carbon emissions (TEDxSanJoseCA/Flickr photo). As regular donors and committee members for this year’s Spartans Supporting Spartans campaign, Cordero and his wife Clare, a lecturer in the engineering department, are passionate about helping. For Cordero, this campaign offers an opportunity for the campus community to come together and feel good about the university. Make a gift through Spartans Supporting Spartans. SJSU staff member Sami Monsur established the Support Our Staff Scholarship after earning a degree in Spanish while working at San Jose State. “I am a strong believer in volunteering and giving back,” says Sami Monsur, resource analyst in the Connie L. Lurie College of Education—and she’s got the scholarship to prove it. In 2012, Monsur established the Support Our Staff Scholarship, an annual $500 scholarship that provides financial support for staff members working toward a degree at San Jose State. The Support Our Staff Scholarship extends similar support to staff members university-wide who are matriculated students, whether they’re employees of the university, Research Foundation or Tower Foundation. Last year the scholarship was awarded for the first time, and now, it’s growing. As one of the gift options for this year’s Spartans Supporting Spartans campaign, Monsur’s annual contribution has already been bolstered by more than a dozen new gifts from other staff and faculty members. “As it continues to grow, hopefully we’ll be able to award two or three scholarships a year,” she says. Make a gift to the Support Our Staff Scholarship or an area of your choice through Spartans Supporting Spartans by April 18. 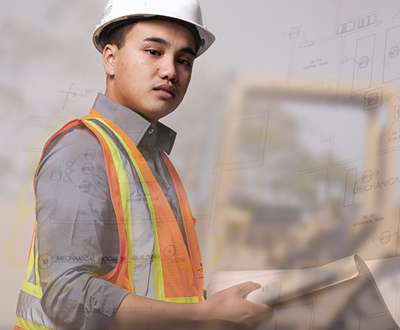 “I never thought I’d be here,” says Quang Le, ’14 Civil Engineering. 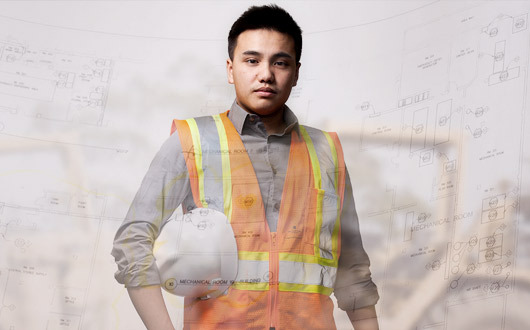 Since transferring from an East Bay community college, Le has completed two internships and was elected SJSU chapter president for the Associated General Contractors of California. This year, he received the Alumni Association Dean’s Scholarship for the Charles W. Davidson College of Engineering. Give $20.14 and vote for the program that the Senior Gift will fund! 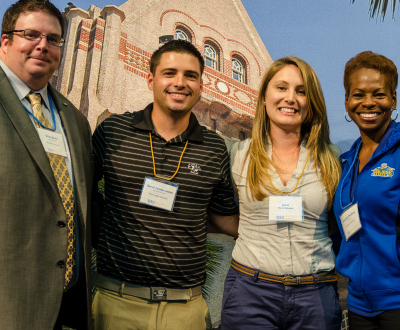 The SJSU Alumni Scholarship Program is one of three options for this year’s Senior Gift. To make a gift and vote for this year’s program recipient, download the Senior Gift form [PDF] or contact Carolyn Canete in SJSU’s Office of Annual Giving at 408-924-1782. “We receive many requests for help,” says Monica Garcia, assistant to the VP for Student Affairs. Garcia’s office oversees the SJSU Student Emergency Fund, which provides financial assistance when students need it most. What can students do if their car is stolen, along with personal items inside, and they have no way to get to class or work? Or worse, what can they do if they’re in a car accident and need money for temporary transportation or uncovered medical expenses? The Emergency Fund provides monetary support for out-of-pocket expenses to students involved in unforeseen, emergency events or situations that affect their ability to function as a student. Students may apply for an Emergency Fund award for out-of-pocket expenses on a one-time basis for up to a maximum of $500; an application [PDF] can be found on the Student Affairs website. The Student Emergency Fund is one of three options for this year’s Senior Gift. To make a gift and vote for this year’s program recipient, download the Senior Gift form [PDF] or contact Carolyn Canete in SJSU’s Office of Annual Giving at 408-924-1782. “If you’re from a high-crime city and all you hear is that you’re not going to make it, know that it’s not true,” says Daniel Harris-Lucas, ’14 Public Relations. 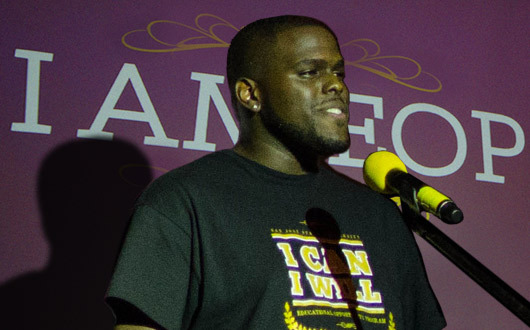 Harris-Lucas was raised in foster care in Oakland after his mother became addicted to drugs. Today, thanks in part to the Educational Opportunity Program (EOP), a group designed to improve support of first-generation, low-income and historically disadvantaged students, he is about to graduate from San José State. EOP is one of three options for this year’s Senior Gift. To make a gift and vote for this year’s program recipient, download the Senior Gift form [PDF] or contact Carolyn Canete in SJSU’s Office of Annual Giving at 408-924-1782. Just three months after ThanhThuy Luu, ’13 Nutritional Science, ’16 MA Public Health, arrived in San Jose from Saigon, Vietnam, in 2008, she started her first semester at San Jose State. “I worked in the food industry in Vietnam and I burned out. 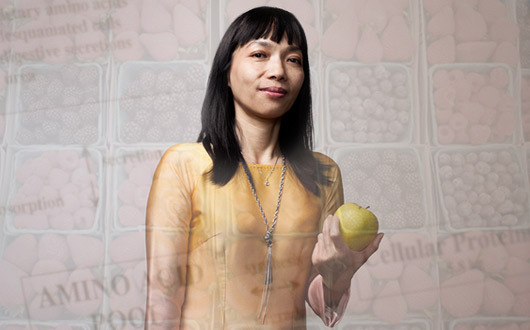 I fell in love with nutrition,” says Luu. 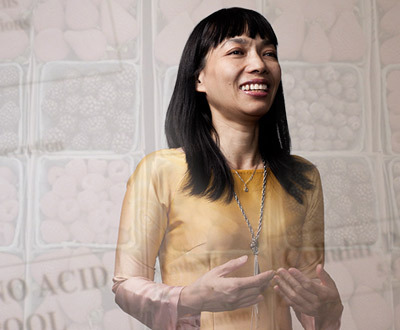 A first-generation college student, Luu already held a two-year degree in chemistry from a university in Vietnam when she decided to follow her heart into nutrition science. View The Power of Gratitude series. “If I hadn’t gotten a scholarship,” says David Fales, ’13 Psychology, “I probably wouldn’t be going to school here.” Which would be too bad for the Spartans. 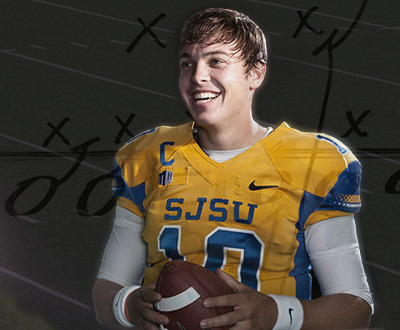 Since the quarterback came to San José State on a football scholarship in December 2011, he has become a single-season record holder in seven categories. 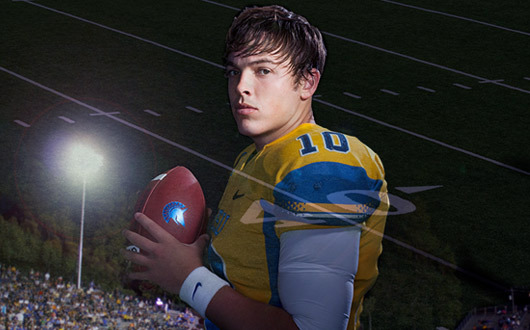 In the 2012 season, Fales led the Spartans to an 11-2 record—throwing more than 4100 yards and 33 touchdowns with a pass completion rate of more than 72 percent—that culminated in a Military Bowl win and a move to the Mountain West Conference. Fales has not disappointed this season either: the Spartans are once again bowl-eligable following their last win, during which Fales threw for a school-record 547 yards and six touchdowns to spoil the Fresno Bulldogs’ perfect season. Ortega has the opportunity to study, work and play with this family in part due to the Katherine Peterson Alumni Association Scholarship. 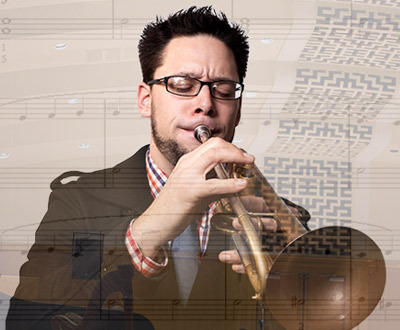 Awarded on the basis of academic achievement, need and community service, this scholarship has allowed Ortega to say goodbye to the days of waiting tables so he can focus on more important things, like running his music lessons business, teaching instrumental music to third through eighth graders at St. Leo the Great School and staying involved with the nonprofit organization, San Jose Jazz. 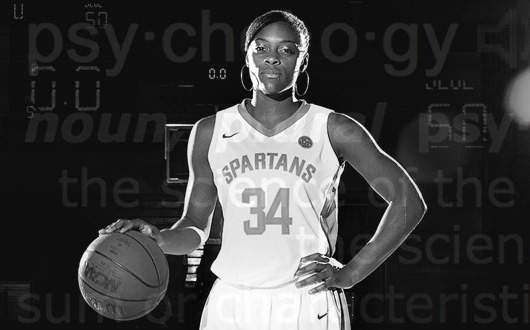 Ta’Rea Cunnigan, ’15 Psychology, is known for her skills on the basketball court, where she’s been helping lead the Spartans to victory. But the 5’9” guard is far from being all brawn and no brains. She has made the most of her San Jose State Athletics scholarship, as a Dean’s Scholar, Arthur Ashe Jr. Sports Scholar, Capital One Academic All-District VIII honoree and Academic All-WAC honoree for two years running.